This article requires a map. Please remove this template from the page when finished. Brinewater Grotto is a small cave on the coast between Solitude Lighthouse and Broken Oar Grotto. Prior to completing the related quest, it is simply a small natural cave that is home to three horkers. Brinewater Grotto is located along the path that leads to Solitude Lighthouse. As you approach the lighthouse, the path splits just before a small jetty with a rowboat moored to it. At the end of the path is a lantern hanging from a post. There is an unlocked wooden chest beside a barrel in a corner of the rock face. On the barrel is an iron dagger and two loose septims. The entrance is just to the left of the barrel and chest. There is quite a bit of vegetation throughout the cave, however none of it is harvestable. The main floor is shallowly flooded, with several rock pillars supporting the roof and a ledge around most of the cave. There is a concealed stone door in the western wall, but you cannot open it from this side. It is your exit at the end of the related quest (see notes). The ledge can be reached by jumping from a rock to the left of this door, although there is nothing of interest up there. During the related quest you will enter from the East Empire Company Warehouse. Entering through the East Empire Company Warehouse leads into a tunnel with a tripwire a short distance along that triggers a swinging mace trap. Ahead you will hear two bandits talking; they are standing on a jetty behind shelves stacked with crates stamped with the East Empire logo. There is a bear trap on the ground between the tunnel and where they are talking. The cave seems to be long and narrow, with the left half a deep stream allowing small rowboats to navigate, hence the jetty. Among the crates on the shelves are: nine bottles of alto wine, two bottles of Nord mead, seven bottles of wine, a silver ingot, five iron ingots, two random potions of healing, two random potions of strength, and a random potion of stamina. At the end of the shelves is a narrow flight of wooden stairs and also an opening blocked by thick cobwebs that you can cut or burn through. Behind this is a short tunnel leading to more thick cobwebs and a small cave beyond that contains three frostbite spiders. On the other side of the cave are more thick cobwebs that open on a ledge back in the main area with a bear trap on the ground, creating a shortcut for the main cave. Climb the stairs to a wooden platform, lit by widely spaced torches that can be taken to darken the cave and help conceal you. Ahead you can see two bandits; one of these is a magic user. Just past these, under the water to the left, is an unlocked chest containing minor loot. There are wooden steps leading down into the water that you can use to regain the path. On your right is the ledge where the spider cave comes out, with stairs leading down from the ledge. 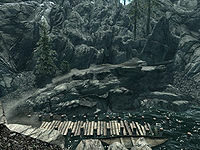 Ahead is a wooden bridge crossing to the other side of the water and on the far side is a bandit archer. A short distance further there is an opening on your left leading into a brightly lit area with a tripwire partway along that triggers another swinging mace, and another tripwire and mace at the far end. Between these are two bear traps hidden among vegetation. Just past the second of the tripwires is a dog that you can hear barking and possibly a dead skeever. There are several bone chimes hanging from the ceiling by the dog and a piece of horker meat on the ground in a wooden bowl. The tunnel emerges back into the main cavern opposite a campfire with several food barrels all around and two bandits standing by the fire. Staying in the main cavern instead of turning left and entering the side tunnel, the path leads around a corner before recrossing the water to the right-hand side. Here is a platform that ends with stairs down. On your left are more stairs that lead down into the water, with another bear trap at the top. Around another corner is the campfire and crossing from the exit from the side tunnel on the left is an earthen bridge. There are several food barrels and an adept-locked chest on two of the barrels by the fire and two metal pots each containing two sear slaughterfish steaks hanging over the fire. There is a rock pillar near the fire and a pressure plate behind it that triggers a battering ram to stop anyone trying to sneak past the guards from the side tunnel. Ahead is another wooden bridge crossing the water with bone chimes hanging under it to catch on anyone trying to sneak through the water. The bridge crosses to a small ledge with a bone chimes hanging from the ceiling by another bridge that crosses back to the final area. There are two rowboats moored to another small jetty with a bandit standing nearby and another patrolling nearby. The rowboats each hold a chest, one of which is apprentice-locked and the other unlocked. Under the water the length of the cave are many clusters of slaughterfish eggs, although there are no slaughterfish. To the east is a large area with shelves stacked on either side, another campfire in the middle and several large cages along the back wall. Gulum-Ei and yet another bandit are standing by the fire. Just before the fire, by a rock pillar on the left, is a long wooden table with benches either side. There are two bowls of horker stew, a sear slaughterfish steak, a slaughterfish egg and some slaughterfish scales on the table. Opposite the table are some wide wooden stairs leading up and behind the shelves on the right to a ledge where four unowned bed rolls and a barrel with an eidar cheese wedge on top are found. There is a random cuirass on one of the shelves that can only be reached from up there. Dropping off the western edge of the ledge leads you to a smaller ledge with two small coin purses on the ground. From the ground, the right-hand shelves hold three chests; one is on the ground and is unlocked, the next with an expert lock is on the first shelf along with a leveled enchanted dagger, a random helmet and cuirass. There is an angled ladder you can climb to retrieve an empty random soul gem and a Dibella statue from the second shelf and the third chest is also unlocked and is on the third shelf with a Markarth guard's shield and a Solitude guard's shield. The shelves on the left hold two more chests; one master-locked, the other expert-locked. There is also a random shield, six common books in an open crate, two random swords and a random war axe, and copies of some rarer books; Hanging Gardens, 2920, Evening Star, v12, Wraith's Wedding Dowry, and Children of the Sky. To the east are three levers that open two large cages and also open a conceal door between them. There is a crate with three fillets of horker meat and three horker tusks on top and a bucket containing two salmon beside it. The cages contain a total of five more salmon. The concealed door opens to reveal the original part of the cave that can be found prior to the quest. The bandits do not respawn and the concealed exit doesn't reset to the closed position, allowing you to enter the cave near Solitude Lighthouse and loot the entire cave once the items found inside the cave have respawned. Any of the swinging maces may be hanging down even though the tripwire is still intact. This page was last modified on 29 August 2018, at 21:23.